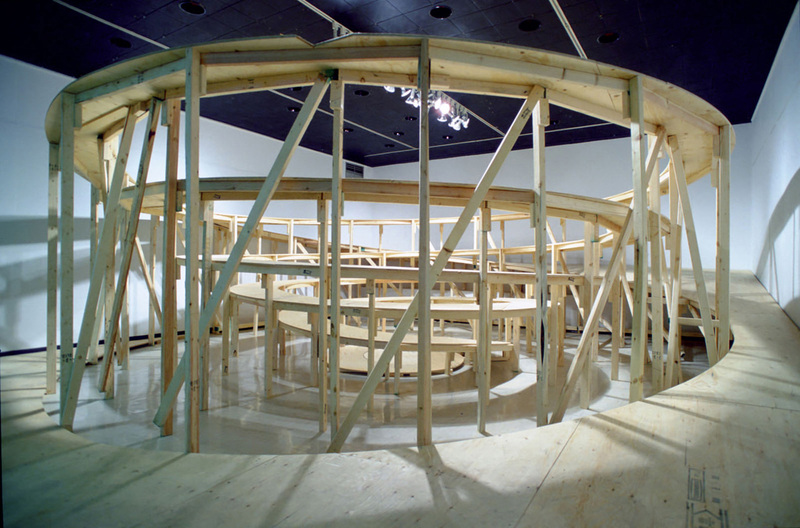 ‘Model for a Public Space’, an installation by Adrian Blackwell (originally titled ‘Spiral Space’), was exhibited in the Architecture II Gallery of the University of Manitoba (Winnipeg, Canada) in 1999. As Director of the Gallery, I secured a donation from a local lumber supplier and assisted Adrian Blackwell, together with exhibition co-curators Rob Kovitz and Eduardo Aquino, with construction and installation of the work. The piece was subsequently installed at Mercer Union in Toronto. ‘Model for a Public Space’, by Adrian Blackwell, installed in the Architecture II Gallery of the University of Manitoba’s Faculty of Architecture.